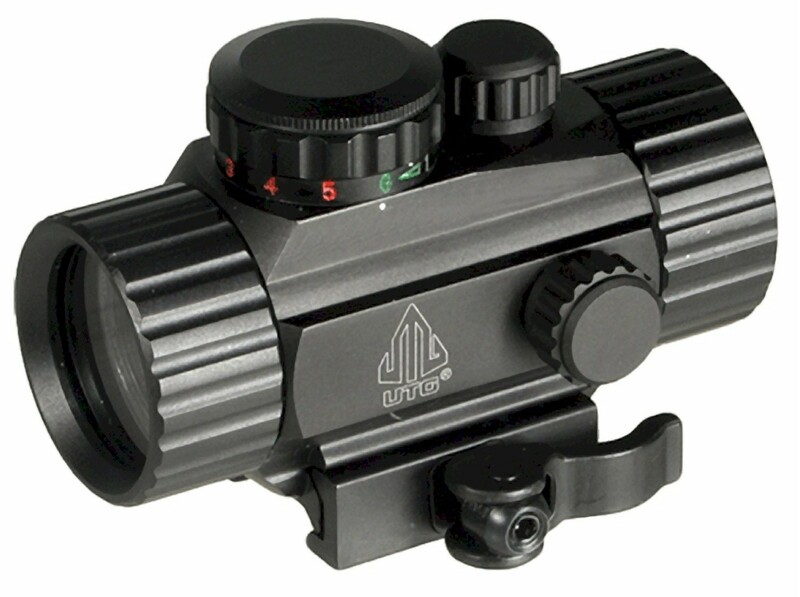 I have used several UTG red dot sights in the past and they have always worked well and are of good quality. The best part is that they are inexpensive. ]The UTG 3.9″ CQB Red/Green Single Dot Sight w/Integral QD Mount was under $40 through Cheaper Than Dirt (see link at end of article). The UTG 3.9″ CQB Red/Green Single Dot Sight w/Integral QD Mount was chosen to mate with a Hi-Point 995TS WC carbine. I had previously mounted the UTG 3.9″ CQB Red/Green Circle Dot Sight w/Integral QD Mount (which had been removed from a shotgun) on a Hi-Point 4595TS, but had decided to go with a single dot rather than the circle dot for the Hi-Point 995TS WC. While the circle dot sight was great for a shotgun (at 15 yards, the shot spread was within the outer circle), and works fine on the Hi-Point 4595TS, a single-dot unit for the 995TS WC carbine seemed to be the better of the two options. The UTG 3.9″ CQB Red/Green Single Dot Sight w/Integral QD Mount is a new Generation Instant Target Aiming (CQB) Compact Tactical Red/Green Dot Sight that is 38MM in diameter with a 4.0 MOA red or green dot. In this section, I take a closer look at the UTG 3.8″ CQB Red/Green Single Dot Sight w/Integral QD Mount and pass on what I observe to you. The black anodized aluminum housing appears robust and constructed well enough to handle rough use and the environment. The lenses have received non-reflection high tech Emerald coatings that mitigate glare and distortion. It is undetermined; however, if the unit is hermitically-sealed and/or water-proof. The UTG 3.9″ CQB Red/Green Single Dot Sight w/Integral QD Mount is fully adjustable for elevation, windage, dot color selection, and dot intensity. 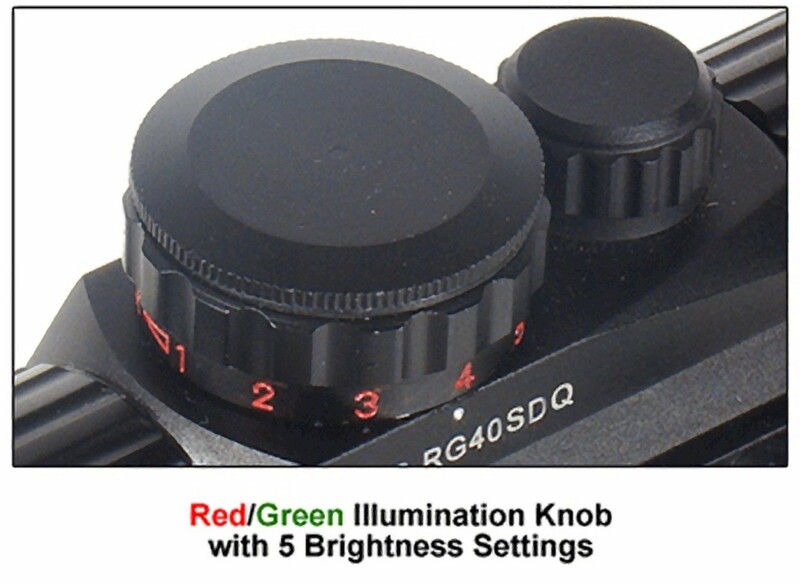 Dot color selection is performed by turning a large step-switch knob (Selection Knob) that is mounted on top of the sight housing. Dot color is clearly marked on the selection knob. The selection knob also houses the majority of the electronics and also a single CR 2032 Lithium battery, which is accessible under a threaded and environmentally-sealed top cover. When placed in the zero position, the sight is not powered. Dot color selection is performed by turning the selection knob clockwise or counter-clockwise from the zero position. The Selection Knob also allows for 5 brightness settings for each dot that allow you to select a brightness setting according to the environment. Brightness settings are clearly marked for each dot color (red and green). The “off” position for each color is indicated alphabetically while the brightness levels are indicated numerically in steps from 1 to 5. A colored arrow also indicates the direction in which to turn the selector knob for each color. The selection knob is stiff to rotate, but detent positions are positive when turning the selection knob from one setting to another. The 4 MOA dot, when set at an optimum brightness setting for your environment, allows you to quickly acquire your target with both eyes open. Too high of an intensity setting; however, may cause the dot to “flare” under low-light conditions. I prefer the green dot for indoor use and the red dot for outdoor use, but your preference may differ. I try to run the dot intensity at the lowest setting possible, regardless of the ambient light conditions, as much as possible to conserve battery power and also to prevent dot distortion. The UTG 3.9″ CQB Red/Green Single Dot Sight w/Integral QD Mount provides a wide range of adjustment for windage and elevation. Windage and elevation turrets are topped off with a threaded cap to keep the environment out. Elevation and windage can be adjusted by turning the adjustment stem in the desired direction with a coin or flat-tipped screwdriver. Windage consist of left (counter-clockwise) and right (clockwise) directions. Elevation adjustment is either up (counter-clockwise) or down (clockwise). Adjustment clicks are positive and adjustment points are clearly marked. Adjustments are in 1/2 MOA increments. The CR 2032 Lithium battery is firmly held into place by the top cover of the Selection Knob. The top cover is smooth and does not provide a means to removing or installing easily. However, the edge of the battery cover is textured to provide a gripping surface. It is best to hold the Selector Housing with the fingers of one hand while the fingers of the other hand turn the battery cap. The battery is placed into position with the positive (+) side facing up. It is possible, and depending upon which direction the Selector Knob is turned, that the battery cap could loosen. Periodic checking of the battery cap’s tightness might be in order during normal use. I recommend the use of light grease on the cap’s threads to help protect the housing and the threads. This also helps to seal the battery compartment. 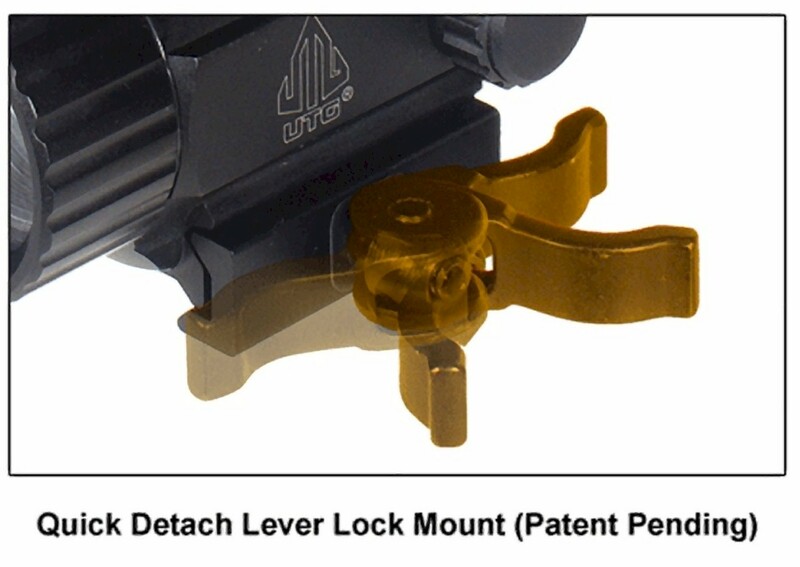 Although intended for mounting on Picatinny rail systems, due to the single point mount system the UTG 3.9″ CQB Red/Green Single Dot Sight w/Integral QD Mount will also mount on most Weaver rails that closely approximate the Picatinny rail system. The UTG 3.9″ CQB Red/Green Single Dot Sight includes an Integral Quick Detachable Picatinny Mount with Fully Adjustable Cam Lever Lock System that provides quick removal and installation capabilities. I would recommend a dab of Blue thread locker be applied to the tension screw to prevent it from backing out during live fire. 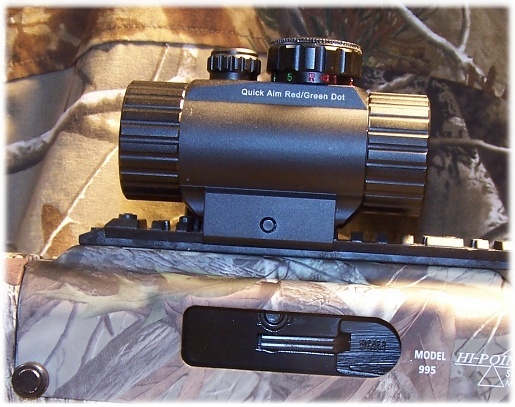 A mounting tension (Hex-head wrench) tool is provided with the sight and provides a means to adjust the mounting tension against the sight rail. The tension screw is located in the center of the Quick Detach lever. Follow the directions provided with the sight to ascertain the correct tension for your particular application. 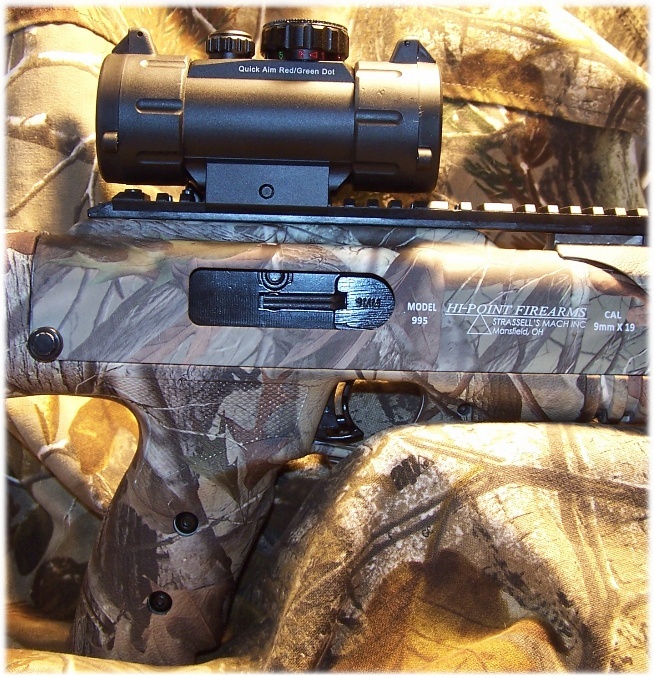 It is advised that that you do not over-tighten the mount, which could result in damage to the rail or to the sight. Spring-loaded, flip-up lens caps provide lens protection. The rubber lens cap housing provides a good fit on the housing of the sight and the flip-up polymer caps seem to snap and hold into place well (on my unit). 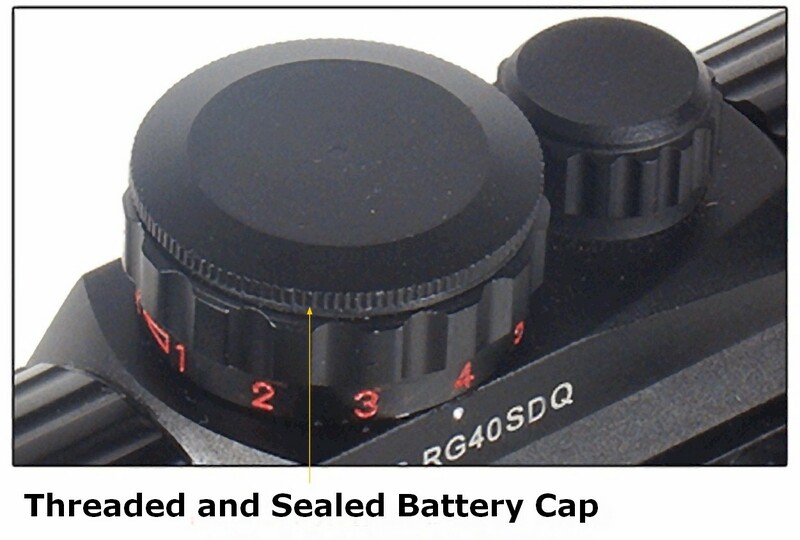 A simple push on the lens cap protrusion releases the lens cap for sighting purposes. UTG also provides a lens cleaning cloth. Each lens protector can be removed from the sight, which allows you to select the flip-up caps for your preference when in the open position, or you can remove the lens protectors entirely. While the lens caps do stay open out of the way, they also stay out of the way against the Selector Knob and elevation adjustment cover if allowed to open up (as opposed to sideways or at another angle) and may cause some consternation when trying to select a color or adjust the intensity of the color. Personally, I like to remove them entirely and run the optic without the covers, or run the optic where the covers will flip down (if possible), which provides full access to controls and adjusters. I have several Leapers UTG dot sights and they all have performed well. The only issue with me and dot sights is my astigmatism; the dot will be slightly distorted rather than perfectly round and that is something that I have adapted to. I have read many reviews of dot sights, and also the complaints of distorted dots. The complaints are usually unfounded as the users failed to realize that it was a physical issue and not an issue with the sight. The lenses are clear and free of distortion. The 5 brightness settings allow the sight to be used in a variety of environmental conditions. I really like the green dot for indoor range work, but it seems to work fine outdoors as well. I sighted through the optic at a target approximately 250 yards distant and had no problem laying the dot on the target. The only issue that I had was when the sun was low in the sky and directly in front of me. But, I have the same issue with any optic and even open sights under this condition. I have run UTG dot sights on numerous firearms, including the Ruger Gunsite Scout, and they have performed without fail. It is quite nice not having to rely on lining up a set of open sights to take a shot. Even if you are off center of the lens, as long as the red dot is on target and you do your part, the bullet will hit your target. I have UTG red/green dot sights mounted on several firearms (rifle, pistol, shotgun, and carbine) and I find the UTG brand to be reliable and durable. I prefer quick-detachment mounts over many others and UTG red/dot sights have met that preference well. 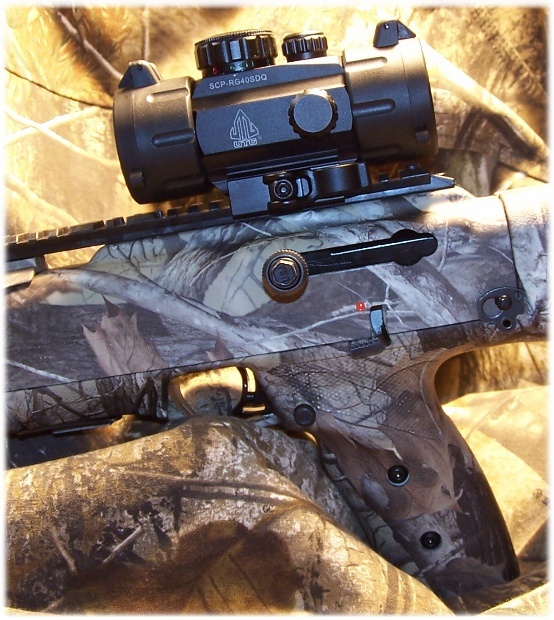 The UTG family of sights meets the need of the sport shooter. From what I understand, red dot sights are even popular among some sporting clay shooters. The UTG 3.9″ CQB Red/Green Single Dot Sight w/Integral QD Mount is an inexpensive means to add red dot sighting capabilities to your favorite firearm; A red dot is a stable sighting platform and can be used with both eyes open, as compared to magnified optics. For most practical purposes, target acquisition is fast and a dot sighting system can be held more stable than a laser sight. Eye relief is not an issue and having a full field of view is quite nice. 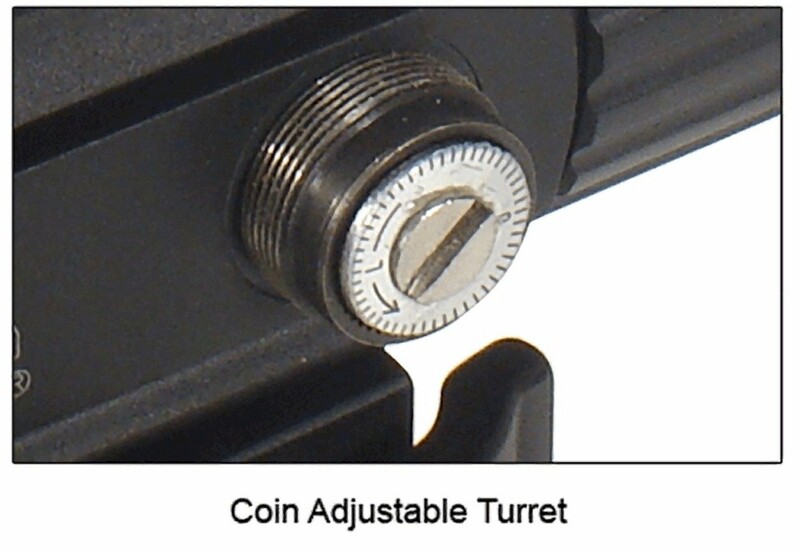 Most dot sights can co-witness with iron sights, although some may require a riser mount to do so. 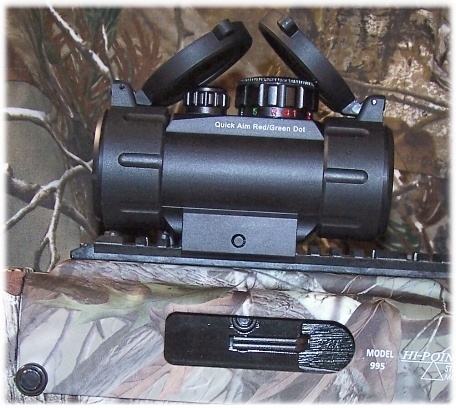 There are also magnifiers that can augment a dot sight’s capabilities. Currently, I am running the UTG 3.9″ CQB Red/Green Single Dot Sight w/Integral QD Mount on a Hi-Point 995TS WC in place of the open sights that came with the firearm. I am running its brother, the UTG 3.9″ CQB Red/Green Circle Dot Sight w/Integral QD Mount on a Hi-Point 4595TS carbine and it has been trouble free. That means that I am totally reliant on the dot sight. That also means that I also need full confidence in the optic that I am using and I have no problem having such with the UTG 3.9″ CQB Red/Green Single Dot Sight w/Integral QD Mount. Overall, the product adds about 12 ounces to your firearm. With the Hi-Point 995TS WC carbine (at 6.25 pounds unloaded), the additional weight is not noticeable at all as I probably deleted 8-ounces by removing the front and rear sight of the 995TS WC carbine. I have run a similar unit on a Ruger bull-barreled 22/45 pistol with no problems with weight. I especially like the large ocular lens as compared to smaller units like the SPARC II, which has a 28mm lens. The larger the lens, the better I like it. The 3.9″ CQB Red/Green Single Dot Sight w/Integral QD Mount is an inexpensive option as a dot sighting system where quality exceeds the cost.